Christina Lee: So Guess What Today Is? So Guess What Today Is? It's the release day of MOCKINGJAY, book three in THE HUNGER GAMES series. I pre-ordered mine from Amazon and want to read it right NOW! Get here already will you? Oh, and if I hear any spoilers about it on Twitter or FB, I'll pop a blood vessel! Off to wait on my front stoop for delivery (why didn't I just order it on my Kindle, darn-it)! This is too funny, I posted the same thing on my blog! I just have to wait until after work to read mine! I promise...no spoilers! I am so excited. It was delivered to my kindle last night. you must email me the minute you finish so we can discuss! I posted pretty much the same thing. lol. I need to get to reading these for sure! When our multitude of boxes were delivered to the store yesterday, I thought of you! It's going to be a week or two before I can read it, so I am also going to do my best to remain spoiler-free! 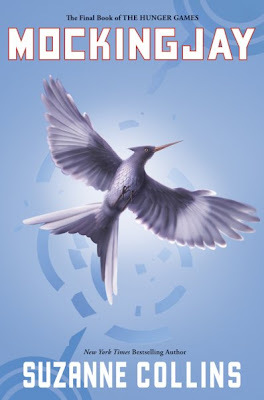 It feels like a holiday...Mockingjay day! I can't wait to talk about it at book club! I'm saying the same thing! I preordered it on Amazon and now I have an iPad and it is taking FOREVER to get here! No spoilers here as I haven't read these yet. Though I have heard good reports all around. Hope you get that new copy soon! When I read the last HP book we were trekking across the country. It took me nearly 3 weeks to read it since I could only get a chapeter or two in a day. I didn't watch or read anything that might give it away! My local bookstore didn't know what this was and no copies were available yesterday, despite my trying to educate the discount store owner about this series back in June. Guess I'm going back to Amazon to place this order. I'm reading chapter one from "The Hunger Games" online right now. It's that good, huh? I finished Breaking Dawn today. I feel a little empty inside. I want more!